Looking to boost employee motivation at work? 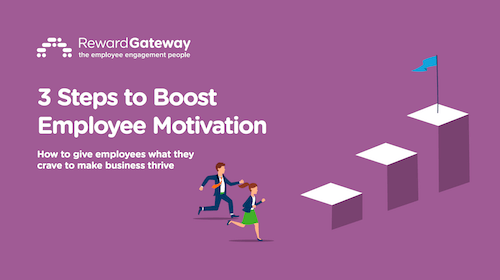 Discover the connection between motivation, recognition and engagement in order to boost motivation and morale at your company in just a few easy steps. 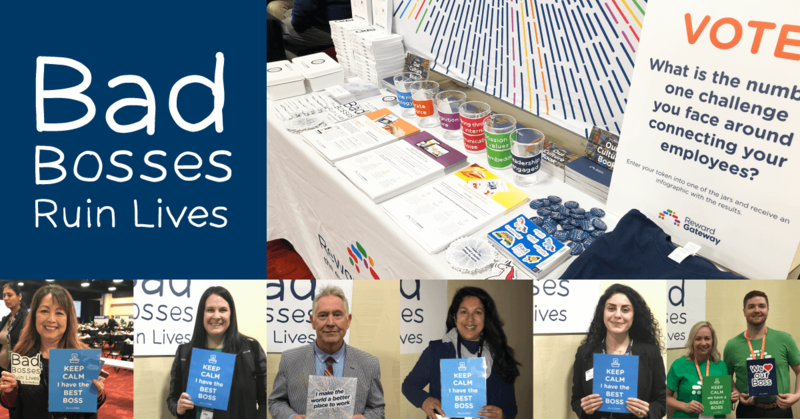 It’s no surprise that our employees want to feel connected to one another and to their organization’s purpose, mission and values. 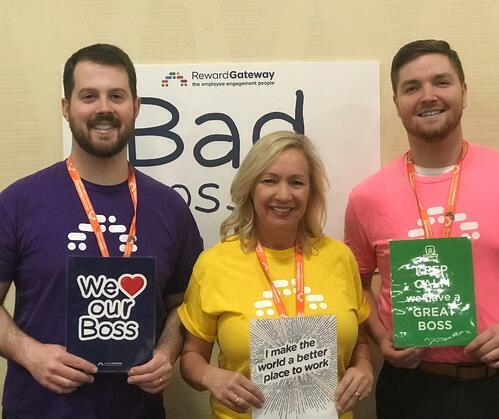 And here at Reward Gateway, we’re on a mission to make the world a better place to work – empowering both managers and peers with the tools needed to improve employee engagement and employee motivation. After traveling cross-country, visiting California last week and chatting with countless HR professionals from various industries, it made me realize something. I had the pleasure of connecting with like-minded people who are passionate about employee engagement, employee motivation and the future of work. A big topic of discussion was about creating a balanced and inclusive workplace – one that is open and honest, establishes trust and creates balance among leadership teams. And speaking of open and honest communication – having a good connection with your boss and being able to communicate openly (with mutual respect) makes all the difference in having a positive work experience and being motivated at work. Unsurprisingly, people leave jobs due to a disconnection with their manager. 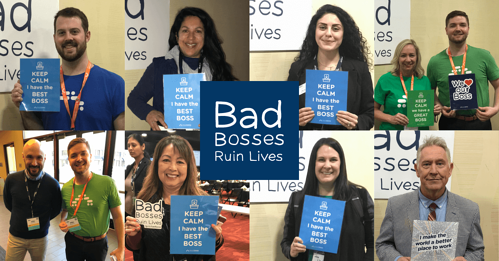 To go along with this theme, we set up our Bad Bosses Ruin Lives photo booth – encouraging people to come and take pictures in support of their amazing bosses. We were so excited about the groups of people who eagerly jumped in and participated. One of the speakers at HR West, Sally Thornton, Founder and CEO of Forshay, discussed the science and research behind having a work/life blend — what we refer to here as work-life integration. She also disproved that millennials are different from other employees in the workforce when it comes to motivation and needs, having fulfilling work and the importance of diversity. Another key point that resonated with me, especially as a father of two young girls, is the power and benefits of sleep. It’s safe to say we made a strong connection with Sally’s talk, as we’ve done some of our own research here at Reward Gateway on the science behind what motivates people at work and demotivators in the workplace. In addition to attending the HR West conference in Oakland, we also attended the Leap HR Tech Talent in San Francisco, with many inspiring talks about innovation and ways to push the boundaries. And the host of the event, Bianca McCann, VP of HR at Trifacta, perfectly summed up the evolving role of HR. She mentioned how traditionally, HR has been thought of as a marketplace with leaders pushing ideas or products out to the workforce and the need to disrupt that outdated way of thinking. People should be thinking of HR’s role as a platform to bring people together and offer tools that improve employees’ lives and performance. Bianca’s presentation went along nicely with the talk our Director of U.S. 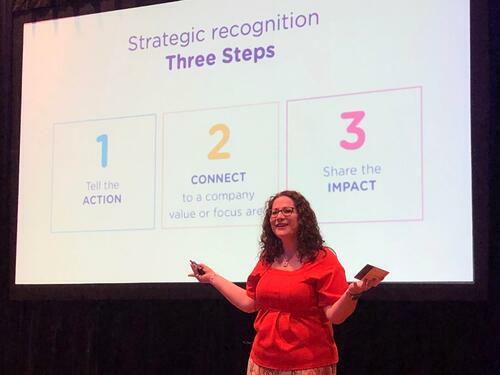 Client Services, Alexandra Powell, gave about the power of strategic recognition, connecting your workforce and the science behind employee motivation. When managers have the right tools, they can empower and connect their workforce, work towards improving engagement and become champions for your reward and recognition program. All-in-all, heading out to the West Coast from Boston last week was nothing short of inspirational and equipped me with new ideas for improving employee engagement here at Reward Gateway. Remember, employee engagement is a journey and it’s something that’s never complete or finished – but the point is to get started, to keep learning and to have an open mind because you never know who you’ll connect with or what new tips you’ll gain to bring back to your own organization. If you’re interested in learning more about our upcoming events or meeting up, check out our events page. Brian D'Angelo is the U.S. Growth Marketing Manager at Reward Gateway. 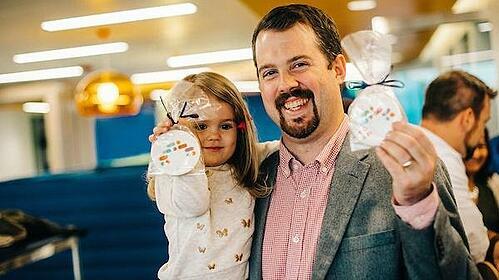 He used to be able to quote a ton of lines from movies, but now with two young daughters, he mostly knows the stories to the Daniel Tiger and Curious George episodes.